King Felipe and Queen Letizia released their annual Official Christmas Card. 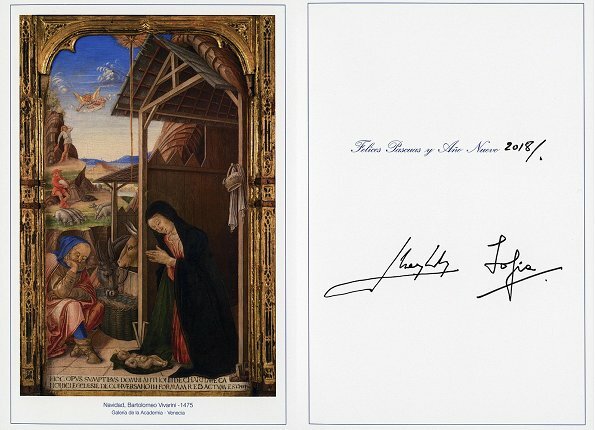 Likewise, King Felipe’s parents, King Juan Carlos and Queen Sofía released theirs Christmas card, as well. 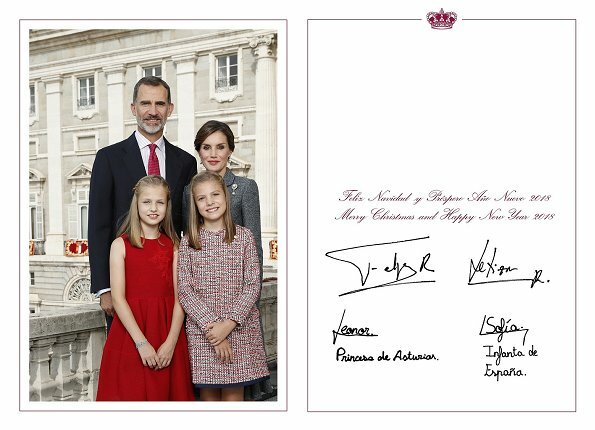 This handout photograph released by Spanish Royal Household on 11 December 2017, shows the Spanish Royal Family's Christmas card featuring a photo of King Felipe, Queen Letizia and their children, Princess Leonor and Infanta Sofía. It's an oddly posed photo of the family. Letizia's head looks like it is growing out of her daughter's. If I had taken this photo of my family I would have hit "delete". Hermosa familia, que la felicidad les acompañe en el año próximo. Letizia SIEMPRE se pone por detrás de sus hijas en las fotos familiares. No tiene ningún problema en conceder a su marido y a ellas todas la importancia. Mujer inteligente. La verdad, no me parece una buena foto. Resulta desequilibrada por las distintas estaturas. Una pena porque el escenario no puede ser mejor y las niñas no pueden ser más monas. Bueno, si están de pie no se puede hacer mucho. Las estatura de cada uno es la que es. ¿Le cortamos al Rey las piernas o subimos a la Reina a una silla? Es cierto que los podían haber colocado mejor, eso sí. Beautiful family, but I would have expected more christmas-y clothes! Coralie, spanish people aren't culturally prone to wear Christmas-y outfits, although you may see this trend a little more nowadays, due to global influence. It looks like this picture was taken el dia de la Hispanidad in October, same outfits. Nice picture but the daughters should be more towards their father's side. Only Letizia's head is showing and it looks weird. Whoever took the picture did a poor job, and not the best choice for a Christmas card.